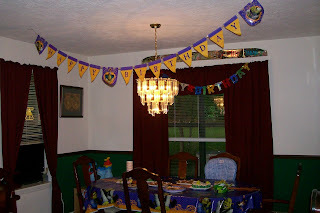 This weekend, Dawson celebrated his 2 1/2 birthday with a Shrek party. He discovered a Shrek book at Barnes & Noble a couple of months ago and has been fascinated with Shrek from that moment on. 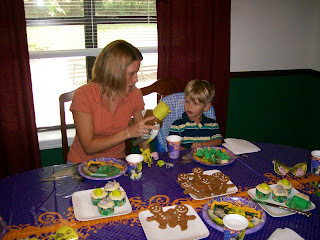 I purchased Shrek party decorations and baked green cupcakes and gingerbread cookies. I was excited at the thought of Dawson's excitement. 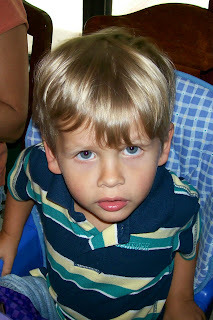 Unfortunately, he was sick this weekend and didn't fully appreciate the party. 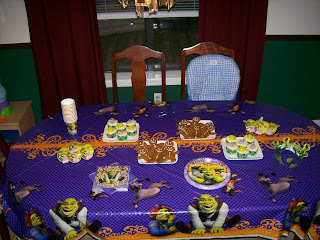 Maybe we'll have another just-for-the-fun-of-it Shrek party when he's feeling better.